Water Pan. Yes or No? When smoking a turkey, should I use a water pan, or does a turkey come out better without using one? Water Pan or No Water Pan? When smoking a turkey, it's not necessary to use a water pan, though keeping a pan full of water in the smoker does have benefits at certain times. In cold weather, a water pan filled with boiling hot water can help maintain the smoker temperature, plus it gets the temperature up quickly for a fast start. This is especially helpful if your smoker can't quite do the job when it's cold outside. When using a vertical smoker, you'll have to use a pan of some kind under the turkey to prevent drippings from falling on the hot electric element or charcoal. You'll have flareups galore, and that's NOT a good thing! 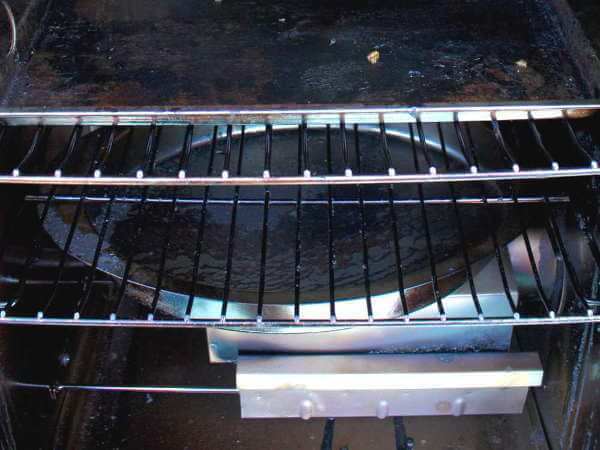 Using the water pan will prevent flareups, since it will catch the drips. However the pan of water will also cause the smoke chamber humidity to be high, which will give the turkey rubbery skin. To solve this problem in a vertical smoker, you can place the turkey on a raised rack, and place the rack in a baking pan. That'll catch the juices, and still allow the turkey to be smoked as usual. Guys, you all are doing it all wrong. When smoking a turkey the best way i have seen is to use apple wood chips. Soak them in apple juice and red wine. Then instead of using water in your pan use the apple and wine mix. Smoke it at 250 for about three hours then wrap it up for the next three. I promise it will be the best you ever have. I always have a problem of maintaining the temperature or it is not high enough, I could get 250-275 degrees in the beginning but after 15-30 minutes, it will drop to 200 or less, I am using vertical water smoker and charcoal, is there a trick, I tried to make half full charcoal pan so then I could have some space to add more charcoal later on. For over thirty years I used a large size Cook'n Ca'Jun Charcoal Smoker and was very pleased with the results and compliments over my smoked turkey and briskets. Over the years I had to continually replace all of the parts individually, one at at time due to rust. The last complete unit I ordered rusted out within two years of use. It was then that I reviewed the web on smoker-grills and decided to buy a Weber 22" Smoky Mountain Cooker. No doubt, the quality of the unit surpasses the Ca'jun, but with the Ca'Jun I could put a 20+ pound turkey on, with a filled capacity of charcoal and fill the two gallon pan with water and seasonings and smoke that bird for 10 to 12 hours with no maintenance. I cannot do that with the Weber. The longest that I have been able to maintain 260 degrees is about five hours before the fire went cold. Refilling the one gallon water pan drops the temperature and slows the process, in addition to the door emitting smoke and heat. I have used different types of charcoal, all top brands, and have not done any better. Am I expecting too much from a unit that possibly was not designed to cook that long a time? I'd appreciate any positive feed back from anyone that might be able to share some helpful hints.